Jonathan Bailor, the author of The Smarter Science of Slim, is becoming a regular here on this site because we just can’t get enough of his good scientifically backed info! First he shared with us how a calorie is not just a calorie, then he broke down sugar addiction with tips on how to break it. And today? He’s giving us the metabolism facts—and why it’s more complicated than just simple math. Be sure to check out Jonathan’s book, his podcast and follow him on Facebook, Twitter and YouTube! Some say the only certainties in life are death and taxes. 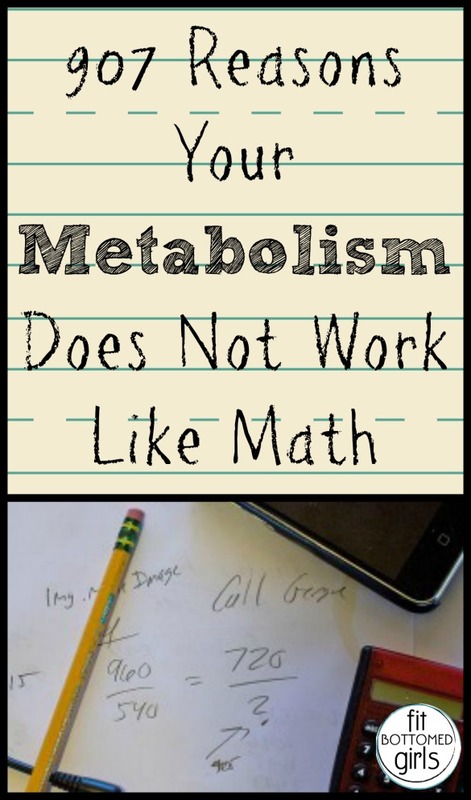 I think we’ve been led to believe there is at least one more: Our metabolism works like math. Calories in minus calories out equals weight gain or weight loss. Eat more, gain weight. Eat less, lose weight. Simple. Obvious. Certain. Or at least that’s what I thought—until I saw hundreds of studies disproving the traditional notion that our metabolism works like math. But wait. Let’s actually do the calorie math and see how the metabolism-works-like-math theory compares to what happened with our weight over the last few decades. According to Dr. Duffey and Dr. Popkin’s data, by 2006 we were eating 570 more calories per person per day than in 1977. It seems reasonable to assume that we gradually worked our way up to 570, so let’s say that for the 29 years between 1977 and 2006, we each ate an average of 300 more calories per day. Three-hundred calories times 365 days in a year equals 109,500 more calories per person per year. If we multiply that by 29 years, we get 3,175,500 more calories consumed per person between 1977 and 2006. Super simple, and maybe that’s why the metabolism math theory is so popular. But does it work out in the real world? According to the metabolism-math theory, we gained weight between 1977 and 2006 because we were taking more calories in. Makes sense so far as we have certainly taken in more calories—3,175,500 more calories per person, in fact! Just one more step to see if this theory works out in the real world. Let’s get out our metabolic calculators and see how much fat we each should have gained between 1977 and 2006. Step 1: There are 3,500 calories in a pound of fat. Step 2: 3,175,500 extra calories divided by 3,500 equals 907 extra pounds of fat. If metabolism works like math, then between 1977 and 2006 we should have each gained about 907 pounds of fat. I know many of us have seen some weight creep on over the years, but none of us are looking down and seeing our scale showcasing numbers above 1,000. Something appears to be is amiss with the metabolism-works-like math-theory. In my previous post, I went over how calories in and calories out do matter—just not in the way we’ve been led to believe. We’ve seen that our body is best understood using biology, not math. And as a bonus, we’ve learned how we can eat more and exercise less and help our body automatically balance calories so that we stay slim. Still sound too good to be true? Have you ever met anybody who eats a lot, exercises a little and stays slim “automatically?” We all have. They are called naturally thin people. So the question is not, “Can our biology keep us in balance automatically?” Millions of naturally thin people have already proven that. The question is: “How can we get our body to work more like the body of a naturally thin person?” Fortunately, the most brilliant medical and scientific minds in the world have proven how we can do that. Learn how to eat right here. We can control our weight, just not the way we’ve been taught. And thank goodness. Otherwise most of us would weigh well over 1,000 pounds by now! This isn’t a math problem, it’s an engineering problem. Your body’s metabolic intake system (digestion, circulatory, renal, etc.) isn’t 100% efficient. Hell, your car is only about 20% efficient and all it’s designed to do is to convert fuel to energy. So you’ll never turn 100% of those calories into stored fat. Beyond that, your body has an optimum rate that it metabolizes calories and as you go above that rate, you experience diminishing returns, effectively lowering the body’s metabolic efficiency even more. That’s neither here nor there though, the point is that you’re applying a mathematical argument that has no bearing on the situation. I’m going to continue with the analogy of the car for a moment, because I believe it’s a good analogy for the biological systems that we’re talking about. We’ve established that the fuel efficiency of your car is about 20%. But that’s an average. If you’re going uphill, you might get 15% efficiency. Downhill might net you a 25% or 30% efficiency. But by and large, you’re going to be getting an average of 20%. Now your BMR works in the same way and it responds to environmental pressures to become more or less efficient. Ever wonder why the first weight that you lose is water? Because water takes a bunch of energy to heat and when faced with a dearth of calories, the body says “I’d rather be a bit more thirsty and conserve some calories”. Now let’s say that you’ve got to drive your car on a road trip for 500 miles. How much fuel is it going to take to get you there? Well, on a fundamental level this is affected by your fuel efficiency in part. Gasoline has a certain amount of stored energy after all, and how well we use that will determine how much gas it takes to get there. But your fuel requirements are also affected by countless other things like the weight of the car, the friction of the drive train, the aerodynamic effect on the body of the vehicle, etc. At the end of the day though, let’s say that you get 25MPG, which would mean that you need 20 gallons of fuel to reach your destination. What the author is stating is that if we put in 25 gallons of fuel, then we’ll have five left over when we get to our destination. That works fine on paper, but that extra five gallons of fuel will do a number of things to the efficiency of the vehicle by adding weight to it, which will put more friction on vital parts of the vehicle, thereby lowering fuel efficiency even more. But we KNOW that the body doesn’t work like a car right? All of our energy gets one pass through the intestines before it’s tossed out. If your body doesn’t get it in that pass, it reemerges tomorrow after your first cup of morning coffee. It would be like a car designed to run a constant feed of fuel to the engine, and if the engine wasn’t on or couldn’t process it, the fuel would just end up on the pavement. So, just like your car, if you don’t put in enough energy, you either run out or you have to find it elsewhere. In the body’s case, it’ll metabolize fat and muscle which will draw down your reserves, thereby losing you weight. Really though, the story at the end of the day is this: If someone’s got to knock established science without a good case or even citing any of his “hundreds” of studies, and if his argument says that you can do something that science has pretty well established that you can’t, at least not without breaking some fundamental laws of thermodynamics, ask him what he’s selling. First: Thank you for all the information. Kinda funny that we have to do so much research to come to this completely sensible solution.